The Omaha contingent at the ISRF included (left-right) Jocelyn Herstein, Shashank Shrishrimal, Jeffrey Moffat, Rachel Utter, Jayme Nekuda, Ph.D., Keith Swarts, Krysten Vance, Zijian Qin, Matthew Martens, Richard Sleightholm and Justin Grassmeyer. 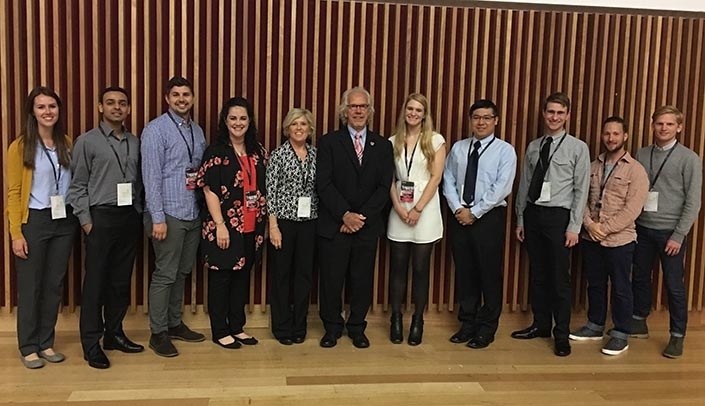 Eight UNMC students and one UNO student attended the 12th annual International Student Research Forum hosted by Griffith University in Queensland, Australia, on June 24-28. The forum was held at Griffith's Gold Coast campus, which is the largest of the university's six campuses and the site of the Health and Knowledge Precinct, which is known for its world-renown research. Griffith is ranked among the top 2 percent of universities worldwide. "The forum was extremely worthwhile," said Jocelyn Herstein, a graduate student in the UNMC College of Public Health. "It allows students to present their research internationally - something I don't think most students have the opportunity to do. Not only does it look great on a CV, it also highlights the work that is being done at UNMC. "UNMC is a global leader in my field, and many of these students/universities wouldn't know about the work that has been done and is currently happening on campus without this forum." A total of 72 students representing seven universities and five countries participated in the ISRF. In addition to UNMC, UNO and Griffith, other universities participating included University of Southern Denmark; University of Chinese Academy of Sciences, Beijing, China; Simon Fraser University, Burnaby, Canada; and Federico Santa Marìa Technical University, Valparaìso, Chile. "The ISRF is an incredible event for students," said Keith Swarts, special assistant for international programs, international health and medical education for UNMC. "It gets them started in their research endeavors and exposes them to other budding researchers from around the world. It also is an excellent way for them to begin collaborating with other scientists. Our UNMC/UNO students make us proud every single year." The mission of the International Student Research Forum is to provide an international stage for graduate students to collaborate beyond the boundaries of disciplines and borders. The forum aims to attract the world's brightest, upcoming scientists and provides an opportunity to showcase world-class education and cutting-edge research. By building relationships with international colleagues at forums such as these, students are forging relationships that can positively yield scientific advances, which could affect countless people around the world, Swarts said. Swarts and Jayme Nekuda, Ph.D., associate director, human resources, attended the ISRF and were responsible for the coordination of the UNMC delegation as well as assisting Griffith University in the organizational and educational actives associated with the forum. They have served as co-coordinators of the ISRF for UNMC since its inception. Topics for this year's ISRF included molecular medicine and biology; epidemiology and public health; infectious diseases and immunology; neuroscience, biomedical imaging and natural sciences; and oncology. UNMC students included Zijian Qin, Jocelyn Herstein, Shashank Shrishrimal, Jeffrey Moffat, Justin Grassmeyer, Krysten Vance, Richard Sleightholm and Rachel Utter. The UNO student was Matthew Martens. UNMC has hosted the forum three times and has been considered the leader in the governing body for providing guidance for the forum. The organizational structure for UNMC's ISRF activities are conducted within the UNMC Department of International Health and Medicine. Professor Kathy Andrews, Ph.D., deputy director, Griffith University's Eskitis Institute for Drug Discovery, delivered the opening keynote address. She cited the value of science collaboration and some of the things that can result from collaboration such as active involvement in interesting science, leadership, good scientific practice, capacity building, respect, discussion and disagreement, trust and confidence, justice and fairness. The students were challenged to develop a 90-second elevator pitch that would summarize their research and be beneficial in portraying themselves to future connections or collaborators. The students also were given an exercise on how to best present their research to a lay person or an educated person not in the same scientific field. This exercise was designed to establish trust between the student researchers and the lay public.